I’ve decided to take the plunge this year and rock out the 4th annual Dark Days Challenge–a blog challenge that pushes each blogger to make as close to all-locally sourced meals at least once a week from December 1-April 15. Somehow I’ve let December just fly by without making hardly any posts, so, wow, I’ve really got to get going to meet the first deadline! So I’ve been on a quest to come up with an easy, delicious gluten-free cracker that doesn’t use 800 ingredients. After all, the seminal New York Times recipe for spelt crackers only calls for three ingredients. So this is what I came up with, and I’m pretty darn happy with them as they are. 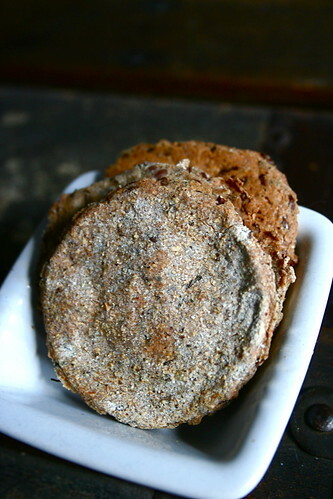 Buckwheat + quinoa + flax seeds = delicious gluten-free goodness to spread some hummus or a slice of cheese on. G with his cracker addiction is happy with them, & with their locally sourced buckwheat from Mabry Mill, they’re definitely 80% local to boot! In a medium mixing bowl, combine the buckwheat, quinoa, xanthum gum, salt, and flax seeds. Add enough warm water to form a ball of dough. Roll out the dough to 1/8″ thickness on a well floured surface. Cut shapes for the crakers from the dough and place on a well oiled cookie sheet. Brush a light coating of water on top of crackers with a pastry brush and bake for 15-20 minutes until golden brown and crispy. Let cool and munch with the topping of your choice! I love homemade crackers and these look delicious. I’ll definitely be trying this! Homemade crackers are the best. What do you think would be best with buckwheat crackers, which I for one have never tried, besides the aforementioned hummus or cheese? Maybe baba ghanouj (er, in summer), sauteed garlic greens, or braised/jammed apples and onions? Homemade crackers, absolutely fantastic. I have to try this great recipe. Awesome! I hadn’t heard of the Dark Days Challenge-I like it!